Hold on to your hats folks I have an easy-peasy recipe to cool you off this weekend. Bonus this recipe only has five ingredients. While it mixes together easily –no heating cream or tempering eggs required, it does need several hours in the freezer to become solid. So plan ahead slightly. Make this tonight or in the morning before you plan on serving it. Birthday cake flavored items have taken the food industry by storm. You can find birthday cake Oreos and M&Ms, candles and lipgloss. 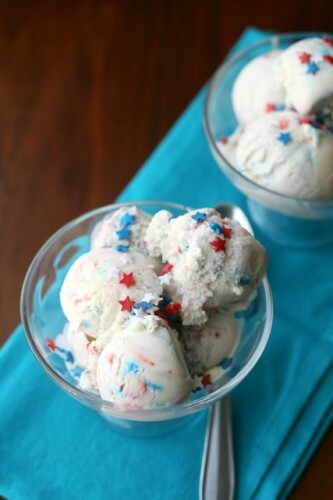 I couldn’t think of a better flavored ice cream to celebrate Independence Day. 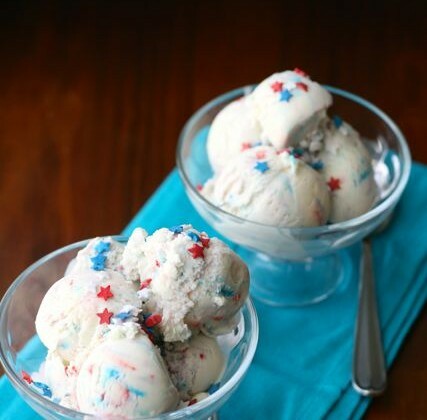 So whether you are making this for someone’s birthday or for America’s birthday your guests will love you. Whisk in cream and dry cake mix. Turn on ice cream machine and let mix for 20 minutes. Stir in sprinkles. Aw this is so festive and fun! 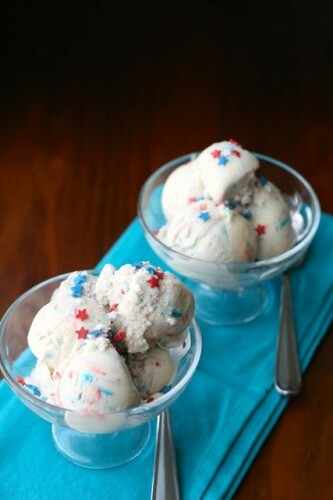 Homemade ice cream is so much fun. Looks delicious!